Do you want to make cool games, impressive animations, and become an all-around Scratch super star? You've come to the right place! 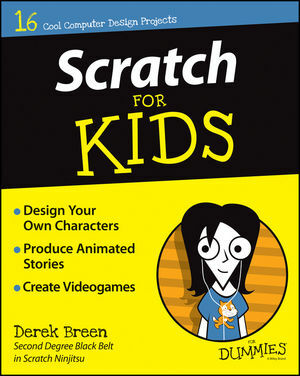 Packed with full-color photos and easy-to-follow instructions, Scratch For Kids For Dummies makes it easy to get started—even if you've never attempted computer programming or coding. Inside, you'll find out how to design and develop your own games, create amazing animations, interact with the online Scratch community, and much more! There's no doubting that Scratch is fun, but it also helps you learn to think creatively, reason symmetrically, and work collaboratively—essential skills for life in the 21st century. Best of all, the software is completely free and runs right in your web browser! With the help of this down-to-earth and friendly guide, you'll quickly discover how to choose from a library of characters, backgrounds, and props, draw your own options, and open another user's project, modify it, and publish it online—all with the click of a button. If you're looking to make the most of MIT's Scratch software but don't quite know where to start, everything you need to try your hand at this popular multimedia programming tool is right here. So what are you waiting for? Derek Breen is a former designer for the Education Arcade at MIT and teaching fellow in the Digital Media Arts and Instructional Design program at Harvard Extension School. He currently develops game design curriculum and learning materials for i2 Camp and provides teacher training in digital design, animation, and game development for K-12 teachers throughout the country.